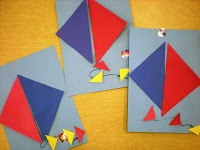 We finished up with our triangles today. I brought in some square cheese and then we cut it in half to make two triangles. I also gave each child a square--good review from last week--with a diagonal line drawn on it. I then allowed them to on the diagonal line to see what happened. They had two triangles "Hurray!" It's always the small things they love. 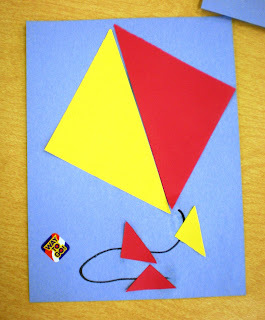 Our triangle page for our book was a kite. I gave the children two large triangles and three small triangles. 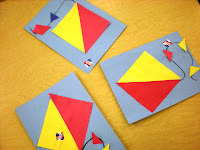 We glued the big triangles in the shape of a kite, drew a string, and added three small triangles for the tail. The papers took a spin around the room too. So we have two shapes down, two to go. triangle page for what book? am I missing something? Hi Clemencia. We are making a shape book. Since we go to school two days a week, we have two pages per shape. My first post on shapes was th square, I think I mentioned the book there. Thanks for reading.